Ice Diving Operations is physically, mentally, and logistically challenging. Proper education in this overhead diving environment is key to a safe and successful operation. This program focuses on planning and implementing an ice diving operation so your team can safely conduct below ice rescues and recoveries. 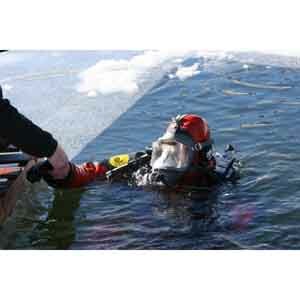 This intense, 24 hour training program introduces the techniques of diving beneath the ice and the proper planning of ice operations in rescue and recovery modes. Students participate in operational planning sessions and make multiple dives under the ice. This training program is also an excellent learning experience for surface-support personnel. Topics include: selecting and using specialized equipment, using underwater communication systems, ice-diving protocols, and special diving techniques. Programs are taught in a classroom, a pool, and at an open water site.